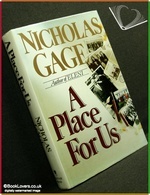 Bantam Press, 1990, Hardback in Dust Wrapper. Condition: Very Good — in Good Dust Wrapper. Heavily faded at the spine of the dust wrapper, more lightly so to the upper panel. Lower panel creased at the foot. Price Clipped. Text complete, clean and tight. Illustrated with black and white photographs. From the cover: “In 1984 the Royal Society of Literature awarded the Heinemann prize for the best book of the year to Nicholas Gage’s Eleni — the true story of how his mother died to save her children during the Greek Civil War. Eleni has sold more than two million copies in fourteen languages and received international acclaim. A Place For Us tells what happened to Eleni’s children after they escaped from their Greek mountain village. Nick Gage was nine years old in 1949 when he and three of his sisters boarded a ship to America to meet the father they had never known. Their fourth sister, fifteen years old, had disappeared, taken behind the Iron Curtain by the guerrillas who killed their mother. Size: 9½" x 6¼". Red boards with Gilt titling to the Spine. 419 pages.